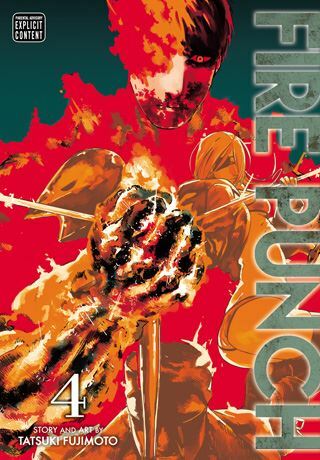 Fire Punch, Vol. 4 (Chapters 29 to 39) opens in the wake of the destruction of Behemborg... by the power of Agni. Now, in the rubble of this city of oppression, Agni is finally face-to-face with the Ice Witch. Meanwhile, a little more than 500 people freed from the city by Agni flee pursuers determined to kill them. Luckily, the disciples of Agni, all Blessed with powers, will save them. When you have people who think you are a god, however, you may have to do more than just rescue them. THE LOWDOWN: The Fire Punch manga is full of surprises. It opened with surprises and continues to offer surprises. A tough-minded, dystopian thriller, it goes in unexpected directions, practically with every chapter, and it is quite imaginative. That is sho'nuff true about the current volume. Fire Punch Graphic Novel Volume 4 is full of crazy people, sociopaths, and assorted maniacs with maniacal plans. Apparently, the Star Wars films' story line was not completed in this world, so completing it is part of Fire Punch's plot. This narrative epitomizes these expressions: off-the-wall and out-of-left-field, so why wouldn't I want to read this basket of unexpected?